A straight stairlift is the simplest solution to the problem of getting up and down straight staircases to take advantage of your entire home. Our stairlifts have smooth, quiet and most luxurious ride quality currently available, and a superb feeling of safety and stability when using the stairlift. Powered by a battery power pack - which recharges automatically - the lift will even work in the event of a power failure. Safety key, to prevent accidental operation or misuse - which is especially advisable if installing in a house with children! Folding arms, seat and footrest - perfect for those with a narrow staircase to take up as little room as possible when not in use. Emergency Brake, ensuring the stairlift comes to an instant stop when necessary. Safety cut-out sensors to detect possible obstructions and stop the stairlifts movement. Diagnostic digital display - Any rare faults with the stairlift are displayed digitally as a number or letter, providing clear and simple information t o relay to customer support and/or an engineer. 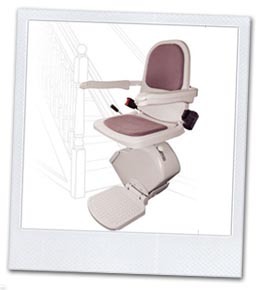 Dual electronic and mechanical braking systems, stopping the stairlift moving in the event of a mechanical / electrical failure. Swivel seat - ideal for those with back problems and those that cannot twist, and providing extra safety by helping to prevent you falling back when stepping off the stairlift. Hand held remote control allows you to summon the lift to where you need it, whichever end of the stairs you are at the time. Complete with optional parking at either end of the staircases, ensuring the battery is fully charged when needed and much staircase space as possible. Battery powered ensuring continual use - even during a powercut! New / refurbished / reconditioned stairlifts to offer you the best possible value! Fast, immediate, hassle free installation. The straight stairlifts are also designed to blend in perfectly with your home decor. A truly state of the art stairlift that combines elegant design and fantastic workmanship, allowing you access to every floor, any time.